We had a day of warmth. I brought two of my grandchildren to the zoo near us, a small-scale zoo, easily understood and easy to navigate, like some say the city of Boston is. One of these two is still in his wheelchair, having RE-broken the leg he broke on January 5th, this time by falling down and twisting it just the wrong way in his very own kitchen. (So close to healed he was! Such a shame!) And so at the zoo we had a wheelchair and crutches, the three of us. ‘We’ were a seven-year-old, his little sister just turned three and me, a person who after this extremely vivid winter looks every inch her age. As we studied the lynx and the llama, the tarantula and the monkeys, the seven-year-old insisted on poling along with his crutches over concrete walkways as compromised by frost heaves as all our roads are. So I pushed the wheelchair. which his little sister decided to ride in, everyone under eight casting aside these aids every three minutes to clamber close to the fences and TRY to see inside the nostrils of the bison; TRY to grasp the sipping-straw legs of the many flamingoes, those comical birds, dipped in pink-orange dye as they appear to be always. And when this happened, I would be pushing the empty wheelchair while carrying the crutches and their two jackets. An hour in, the boy with his heavy cast and crutches finally did grow weary. “I think I need the chair now Callie,” he told his sister. So the boy settled in the wheelchair, I hoisted his little sister up into the chair, balanced the crutches across the top and hung the jackets from the crutches’ two ends. The little girl loved the snow leopards best. Pointing to the three heavy rubberized balls set in their environment for them to paw and play with, she told me gravely, “Those are their eggs,” and I wasn’t about to correct her. The chair lurched at every crack in the concrete and we were all getting tired, but just then an older man appeared who volunteers at the place. “Which way is out?” I asked him, the grounds having begun to somehow seemed to me less small-scale and easily grasped than I had thought. AND the sighting of two mammals capable of laying large round eggs. It was a a great afternoon, and for one short hour the temperature hit 60. According to weather.com, next Wednesday the day will start out at 17 degrees but we’re getting there, WE”RE GETTING THERE ALL RIGHT …..aren’t we? We must be getting there…it just may take longer this year than last. 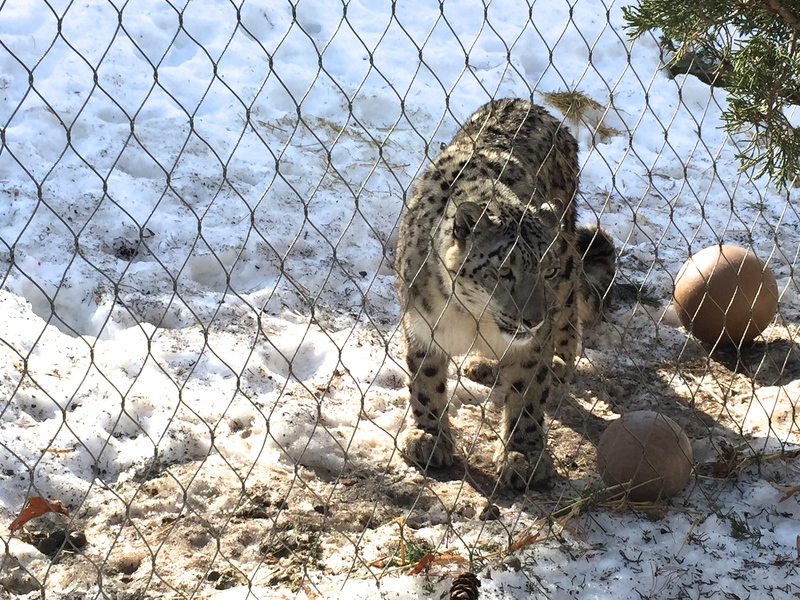 The snow leopard looks happy in the snow … I love the first warm day after Winter – it is the best. Here in Michigan, we are getting 65 degrees on Monday the 16th, which they say is above normal … then turning colder again. Ugh! you’re so lucky Linda! It will start out at 17 degrees here in Monday – Send it our way !